Or, as my oncologist put it yesterday, "Are you going camping?" :-) So far, I seem to be the one who brings the most stuff -- pillow, hoodie, warm socks, blanket -- though I think next time I'll leave my pillow in the car. I haven't had to use the other items (yet), but I figure better to have and not need, than to need and not have. The center stocks blankets, but the nurse had informed me that sometimes they run out. M carts her own stuff with her to have while she waits (including take-out from a local diner), which uses up her own carrying capacity. There are about 15 lounges arranged in a broken rectangle in the bay, with more in a straight line near the entrance, across from reception. The bay is used actively for chemo, while the line by the entrance is more of a patient waiting area. M and I sat in the "entrance" chairs while I waited for my Neulasta shot today. In my case, the lounges are all blue -- some dark, some light, some floral blue. All can have their feet raised and backs tilted to be more horizontal. The dark blue chairs are wider and come with side tables. At my first infusion on May 8, a gentleman in another chair told me, "You'll get used to this." (I'm not sure if those were his exact words; I was too nervous.) Yesterday I felt considerably less apprehensive, having been initiated into the process. I exchanged greetings with the woman in the next chair. Her treatment was just finishing up. My port is accessed for blood tests on the day of chemo. My arm is accessed for my other weekly tests. More colors! Yesterday I sat in the chair (floral blue) closest to the nurse's station. It gave me a good vantage point for people-watching. 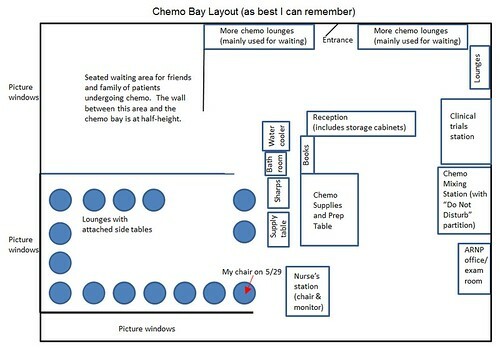 Most of the conversations occurred between medical staff and patients or between patients and companions during the short periods companions are allowed in the chemo bay. They're asked to stay in the waiting area because the chemo bay has high traffic. 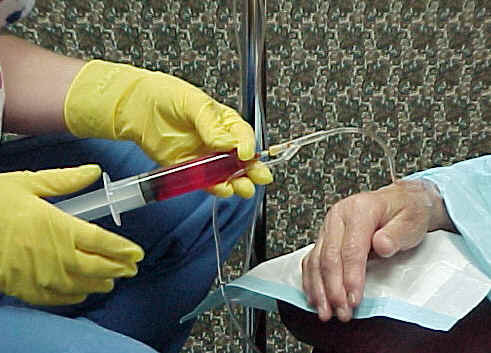 An IV alarm can go off (or several, simultaneously), indicating that a med has emptied or that there's air in the line. That calls for a well-traveled med cart. Patients are ambulatory as well. Our IV poles are very maneuverable, which comes in handy for trips to the bathroom or to the water cooler. 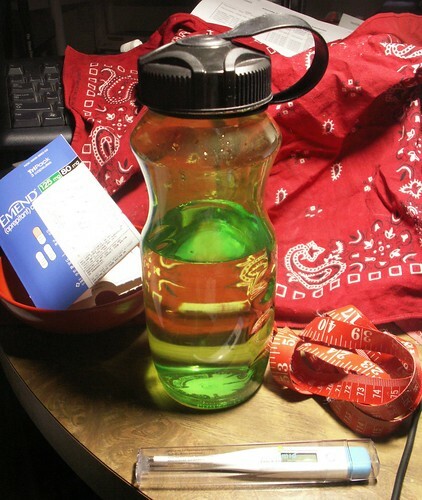 During yesterday's infusion I made two bathroom stops and two water cooler stops to refill my 28-oz. bottle. Before I was hooked up, the nurse who staffs the nursing station double-checked my blood work and made sure my oncologist had given the go-ahead for chemo. After making sure she had the right person (two questions I'm asked all the time are, "Is this you?" and, "What is your date of birth? 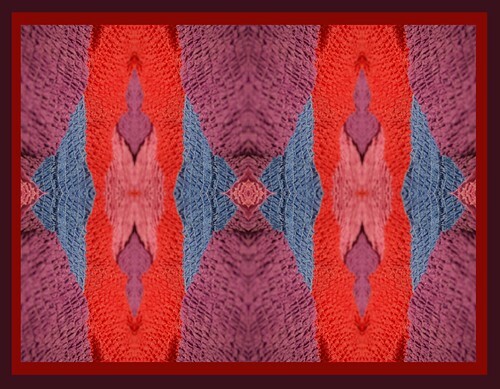 "), she then gave me the go-ahead to take the first, higher-dosage Emend pill in my 3-pill pack. We then needed to wait for my body to absorb the anti-nausea drug. Before receiving chemo I was hooked up to IVs of another anti-nausea drug, Aloxi; and a steroid, Decadron, which both curbs nausea and increases appetite. Add in some saline solution for good measure. It took my chemo nurse several minutes to perform the push. She calls it "red Kool-Aid," but I've also heard it called "red devil." My bathroom breaks at the cancer center produced some pretty pink pee. That extra coloration is almost gone 24 hours later, but it takes a full 48 hours for chemo drugs to leave my system. That's one reason for all my water drinking, including 18 glasses yesterday. (My average water consumption is considerably less, even my 10+ glasses a day to combat dehydration from chemo, but I really need to drink on infusion day.) I could detect the taste of my water changing while still in my chair -- not a big change, just "off," somehow. For much of my almost-four hours in the chemo chair, I sat with my eyes closed and my earbuds in, listening to the epic music of Jeremy Soule. I may have looked as though I was dozing, but I was in another world, a warrior armed with toxins against cancer. I had no visual fantasies to go with this. The music was enough. When my eyes were open, I people-watched. Over the course of my stay, a red sharps container the size of a tall kitchen trash can was removed twice by one of the nurses. I lost track of the number of times the med cart was wheeled back and forth or the number of alarms that went off, including mine. Or the slow procession of five-wheeled IV poles by those of us tethered to them. Two people who arrived after me were transported by wheelchair. Two had also brought (and used) their own blankets. A man seated in one of the dark blue lounges with side table had brought his own crackers and juice and was the only person I saw eating during chemo. I had brought a peanut butter sandwich with me, just in case, but I didn't eat it until after M and I had returned home. A young woman, 30-ish, had come accompanied by two children, who peeked at her over the half-height wall separating chemo bay from waiting room. She had brought a black blanket with silver accents. The black matched the color of the drug she was getting. An older man with deep circles under his eyes had his lounge in the full horizontal position. When he wasn't asleep with his mouth open, snoring, he was taking calls on his cell phone. Ahead and to my right stood a black floor-to-ceiling stand of locked bins, including a computer screen where meds were logged and passwords entered. One sign on the bins detailed drug interactions. The chemo mixer punched in codes to unlock each bin door as needed, moving drugs both in and out. From time to time she disappeared -- gloved, aproned, and masked -- behind a partition marked with a Do Not Disturb sign and a big red STOP sign stating that chemo was being mixed. Patient safety isn't the only issue. It's a dangerous job, as I learned from this article. Those of us in the chemo bay, sitting quietly or stretched out in full on the lounges and ranging across at least three generations, don't look like warriors rushing headlong into battle; but we are. So, too, the double-gloved nurses who mix and transport our poisons to us, handle the sharps, and answer the alarms. For the most part, my side effects haven't yet hit me as hard following my Cycle 2 infusion as they had following Cycle 1. My appetite was better yesterday than on May 8. I don't currently have the edema that I had experienced then. I did not feel the brief, all-over body tingling that I had experienced on May 8. I did have a few hot flashes and sweats, a new side effect for me. They didn't last long. It remains to be seen how deep my fatigue goes this time around, or how pronounced my constipation or the other, less pervasive side effects that have come and gone. This photo shows some of my tools of the trade. The Emend (anti-nausea) pack is in a red bowl that also holds OTC meds that I put out the night before. I've been instructed to take Claritin and Tylenol on the day of chemo and for 4-5 days thereafter, to help combat side effects. I also take vitamins C and D. When I awaken in the morning, my med bowl is ready for me. The thermometer is a freebie from the cancer center. I take my temperature nightly -- if it reaches 100.5 F I need to call them. I tend to run cool. My baseline temperature prior to starting chemo was 97.9; the highest it's gotten so far has been 98.7. The night of my first infusion it had fallen down to 96.0. Last night, after my second infusion, it clocked in at 96.8. I use my tape measure on my right foot and calf to determine the extent of edema. I had experienced mild edema after my first infusion, with my calf swelling to 14.75 inches from its baseline of 13.5. Swelling had taken a few days to return to my baseline measurements, concurrent with losing the five pounds I had gained overnight after my first infusion. Following yesterday's infusion I also gained five pounds overnight, but so far I have experienced no edema. I've learned to take walking breaks and to keep my feet elevated as a precaution.